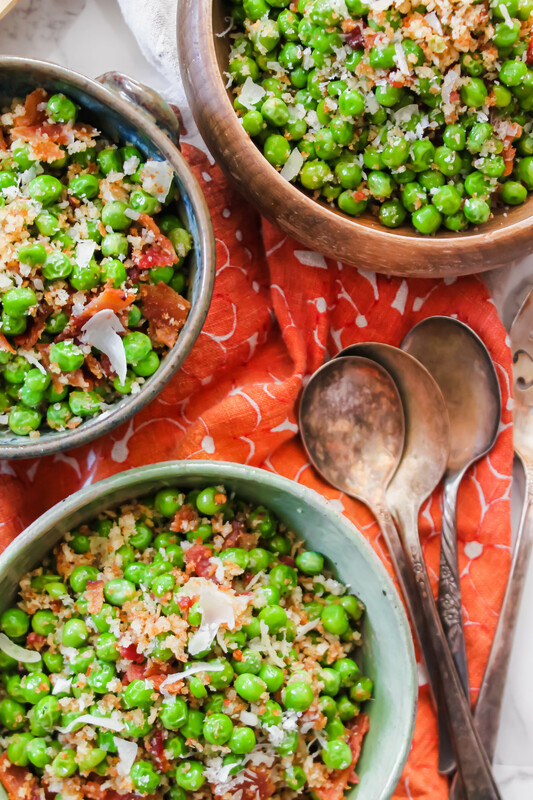 Tis the season for side dishes – and after you take one bite of these Parmesan Bacon Panko Peas, you’ll understand why I keep at least 4-5 bags of frozen peas in our freezer at all times! I used to hate peas. They were bland, mushy, and just never delivered anything worth me tasting. Thankfully, I took this into my own hands and gave peas a second chance. 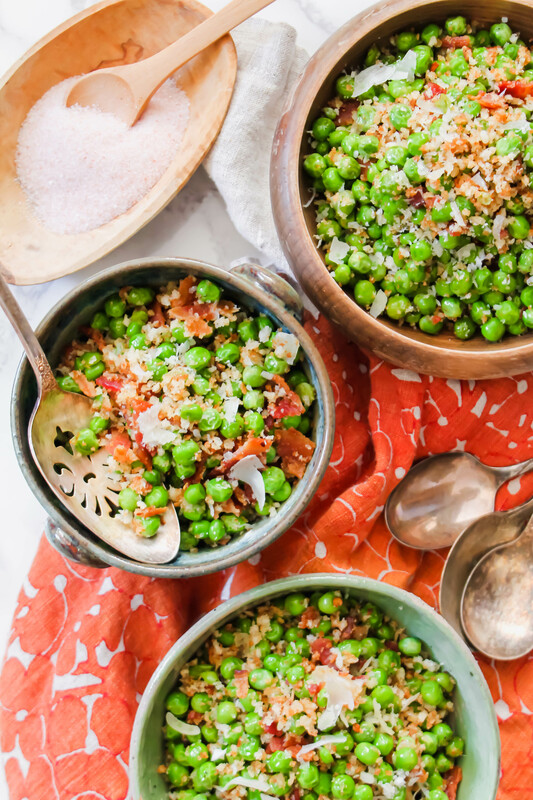 Today I present to you these Parmesan Bacon Panko Peas – yes, there is parmesan, bacon, and panko breadcrumbs in this recipe – five ingredients plus some seasoning and you’ll be well on your way to having the tastiest pea side dish you’ve ever tasted. It’s all made in one pan: you cook the bacon in the pan, sauté the peas in the same pan, crisp up the panko all at the same time. The parmesan gets added at the end so it all doesn’t melt to quickly, but the peas are never overcooked, have a little char on them if you cook them over high heat, and the panko breadcrumbs add great texture! Get creative with this recipe and use ham or whatever cured meat you’d like (heck, get fancy with some chorizo or prosciutto! ), finish with fresh herbs and butter if that’s your thing. Simple, easy, and flavorful – just like dinner should be. These Parmesan Bacon Peas are the perfect side dish to any meal - whether it's a holiday dinner party or a quick 10 minute weeknight meal! Thaw the peas in running water and while they defrost cook the bacon. Add the chopped bacon into a sauce pan over medium heat and cook until crispy. Remove bacon and add the drained peas. Saute over high heat until warmed through and they have. little char on them. Stir in the panko and toast for 2-3 minutes more. Turn heat off, add the parmesan and cooked bacon. Season with salt and pepper, along with the red pepper flakes. Serve warm or room temperature. This looks so yummy! I just developed my own version of “vegan bacon” using mushrooms and liquid smoke (which I previously didn’t care for, but now LOVE). I also make homemade vegan parmesan so… I’m definitely making a vegan version of this dish!